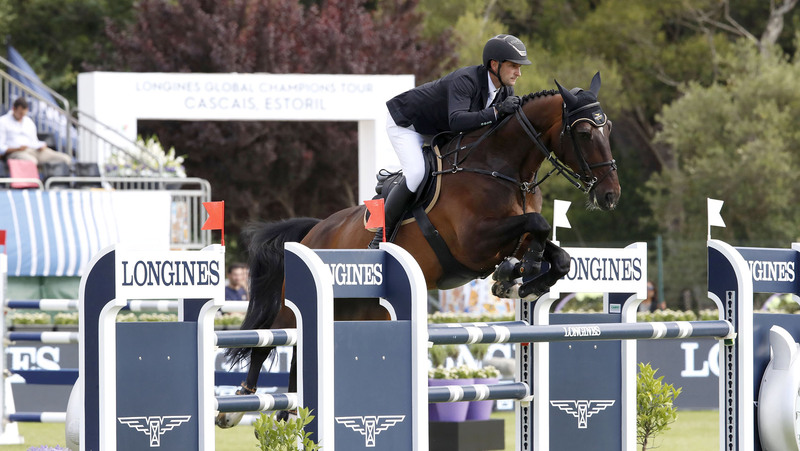 From start to finish there was only one winner in today’s first CSI5* class on the second day of the Longines Global Champions Tour of Cascais, Estoril. Leading from the off, Karel Cox (BEL) pulled out an unbeatable speed class round with Evert - taking the win by one hundredths of a second ahead of Yuri Mansur (BRA) and third place man Mark McAuley (IRL). First to go Karel Cox (BEL) set off at a speedy pace with Evert, the pair deceptively fast around the galloping grass arena. Flying along the distances, the duo - who won the speed class at LGCT Hamburg - powered through the finish gates in 63.09s, throwing down the gauntlet to the rest of the 44 starters yet to come. His clear was quickly followed up by Mark McAuley (IRL) who shaved off milliseconds with Vivaldi du Theil, sprinting around to stop the clock in 63.40s - just behind Cox. The pressure was on for the rest of the field, and the deceptively simple course and almost matching times heaped the pressure on the international field, with riders either going full throttle or using the class to jump a steady clear. Scott Brash (GBR) also delivered a masterful clear with Hello Forever, the popular chestnut horse looking on flying form as they cruised the grass arena. A time fault for Nicola Philippaerts (BEL) with J'adore van het Schaeck also dropped them out of the placings, with Lorenzo de Luca (ITA) and Halifax van het Kluizebos similarly picking up two faults. Yuri Mansur (BRA) and Amor, fresh from their win yesterday flew around the arena looking dangerous to take over the win. The duo were neck and neck with Cox’s time but couldn’t quite reach it, stopping the clock just 1 hundredths of a second behind to finish in 63.19s. But it was Cox who was unstoppable in today’s speed class, collecting the win and the lion’s share of the prize money. The next class, a 1.50/1.55m CSI5* with jump-off will kick off at 21:00 local time, tune in to GC TV and Facebook Live to watch the action unfold.